Get Out and Enjoy the Park! First of all, no matter where you are in the park - make sure you hang out for the sunsets. Joshua Tree is very fortunate in that it frequently has amazing sunsets. For Photographers: Make sure to stay about 1 hour after the sunset. This is the time when the colors come out in the sky and you get those amazingly deep blues. EXPOSURE DURATION: Whatever the meter/histogram indicates. Check your histogram after every shot - it gets darker every minute. Consider taking a Photographer Workshop, they know the best locations, and times, to get great images in the park. This area is a favorite of the climbers for both camping and climbing. It's also a great place to see the climbers in action. Right next to Intersection Rock is Old Woman Rock. It's another favorite spot for climbers. It's also an amazing rock formation. If you look closely, you can see the "Old Woman" with her arms outstretched - wearing a 50's triangle dress. You can see her in the picture above. If you're looking for a nice little stroll, take a walk around Old Woman Rock - it's not very far, and you'll find some other simple trails to follow back there. You won't get lost. You can take pictures all the way around it. The sunset picture at the top of the screen was taken near Old Woman Rock, but looking West towards the sunset. Hidden Valley is across Park Blvd from Intersection Rock. This is a classic hike in the rocks. It's a well marked trail, so it's easy to follow. There are some picnic tables there for lunch. If you hike around behind the picnic tables, you will find some amazing boulders - and a few ancient trees. Because of the draught, Barker dam has been mostly empty for quite a white. Regardless, it is a nice hike with some interesting rock formations. KEYS VIEW - COURTESY TRAILTOPEAK.COM - THANKS DREW, JULIA AND ISLA! Keys View offers an amazing view of Coachella Valley (Palms Springs & Indio). The elevation is over 5000 ft, so this is one of the first places to get snow each season. There are a few turn-outs on the way up the road - it is worth stopping and hiking around - the vegetation is much different up there. Right at the corned of Keys View Road and Park Blvd is Cap Rock. You'll know it when you see it - There is a rock up there that defies gravity. There are some picnic tables here for lunch. This is a nice area because there are some self-guided walks around the rocks. The shot above was taken on the path - looking back at Cap Rock (at about 6am in the morning, just as the sun peaked up over Ryan Mountain - and illuminated Cap Rock.). This is one of my favorite places. Gram Parsons was a Rock star in the seventies. He was in the Flying Burrito Brothers and he hung out with the Rolling Stones, the Eagles,... Gram loved to come to Joshua Tree National Park for inspiration. And he died having too much fun at the Joshua Tree Inn. There is a room named after him there now. Well, somewhere along the way, he had requested that his ashes be scattered around the park (highly illegal), so his friends kidnapped his body (and casket), brought it behind Cap Rock, filled it with gasoline, and set it on fire. Well, of course, people got arrested... There is even a movie about it - Grand Theft Parsons. True story (click the picture for details). You can find the spot where the casket was burned when you walk around Cap Rock (opposite side from the picnic tables). Look closely for the marking "G P" (Gram Parsons). The Jumbo Rocks area goes on for miles. There are over 100 campgrounds hidden nicely from view in there. If you want to check this place out, just find a turnout and take a hike it. There are unusual rock formations in every directions. 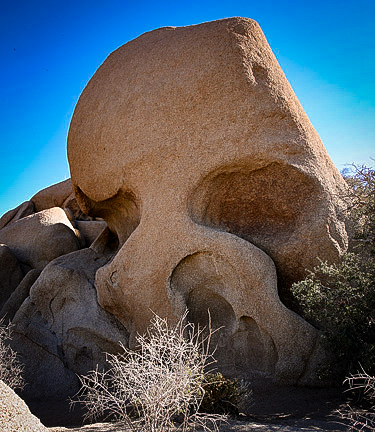 Skull Rock is right by the road - You can't miss it - there is a sign - and about 10 cars on weekends! If you are coming into the park from Hwy 10 (Phoenix / Indio) you will be driving on the Pinto Basin Road. You will notice that there are no Joshua Trees out there. That is because - even though you are in the Joshua Tree National Park - you are in the Sonoran Desert (which runs to Arizona). As you travel about 30 miles in, you will start to see Joshua Trees - this is a sign that you have entered the Mojave Desert. If you entered thru the North Entrance (29 Palms) or the South Entrance (Hwy 10 / Phoenix), Arch Rock is a good first stop for exploring. It's in the White Tank Campground. If you are coming in from Hwy 10, you will pass this spot on your way into the park. It's a huge field of Cholla Cactus. This is great for shots at sunrise and sunset - and during the flowering season in spring.